When you buy a colored gemstone from a reputable gems dealer, the dealer will guarantee the authenticity of the gem. For example, he will guarantee that a particular stone is a natural ruby from Burma and has not been treated in any way except simple heat. Usually a dealer will also guarantee his clarity grading of the gem. Most gemstones dealers have years of experience with the gem varieties they sell. But even the most experienced dealers will back up their guarantee with certification from a recognized gemological laboratory. If you are buying an expensive gem, it is always a good idea to insist on a gemological certificate. The extra assurance of a gemological certifcate not only provides peace of mind, but it can be useful for insurance purposes and future resale. In many cases a gemstone, especially a higher end stone, will come with a gemological certificate included. In other cases, a dealer can arrange certification for a gem, usually at a nominal cost. Many trained gemologists can do gemstone identification, but it is always best to have a gemstone certified at a gemological laboratory that specializes in gemstone testing. The reason is that the better gem labs can afford to invest in the latest high tech diagnostic equipment, and they have a strong incentive to issue only correct and reliable test reports, since they have a reputation in the marketplace to protect. Certification issued by the dealer is less useful, even if the dealer has graduate gemologists on staff. This is because certification should be done by an independent authority with no stake in the transaction. There are many reputable gemological labs. But some labs are particularly distinguished, since they not only do gem identification but also engage in original gemological research and are expert in detecting gem treatments. Some leading labs can also certify the origin of gemstones, though this is usually confined to important varieties such as ruby, sapphire and emerald. A proper gem certificate should include the exact measurements and carat weight and a photograph of the stone. The certificate should state the identification of the species, such as "natural sapphire" or "rubellite tourmaline." A very important part of the certification is the report of any treatment, since the treatment may have a significant ‎effect on value. A capable lab should be able to determine definitively if a gem has been heat treated or diffused or fracture-filled, for example, and this will appear on the test report. Generally gemological labs avoid qualitative judgements about a gem, and stick to properties which can be measured scientifically. However, some eminent labs such as AGL (American Gemological Laboratories) and GRS (GemResearch Swisslab) have begun to use color descriptions that go beyond "red," "blue," etc. 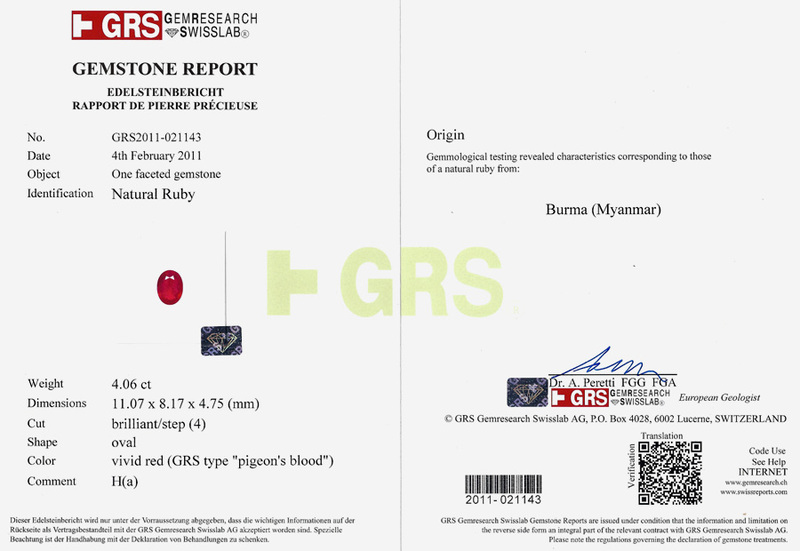 GRS, for example, now describes the top color for Burmese rubies as vivid red (GRS "pigeon's blood red"). But thus far none of the leading gemological labs provides a financial appraisal of a gem. That is still a matter for the market, not for science.